LESS FRICTION The new resin hardware reduces friction by nearly 50% compared to traditional mounting hardware, allowing the shock to respond faster to all linkage movements. 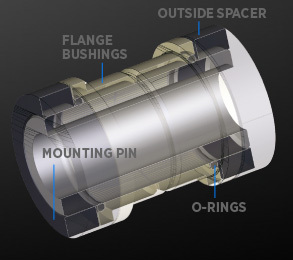 CLEAN AND DURABLE O-rings and the flanged bushing design blocks out dirt and mud. In lab tests, shocks submerged in muddy slurry lasted 10 times longer with the new hardware. NO TOOLS REQUIRED All pieces to the hardware system can be mounted to the shock and removed by hand. SELF-CONTAINED Shocks are shipped with all hardware in place. No more zip ties, cutting or prepping — just mount and ride.